This combination of yellows and white is truly inspiring and refreshing. I often use white in sitting rooms - especially ones without much traffic. White can be such a welcome addition to a home because it gives such a crisp, clean look. 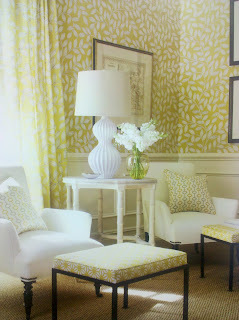 The yellows are Benjamin Moore's Lemon Chiffon on the trim mixed with Sulfur Yellow. The trim of the furniture is in a Tudor brown. Take a moment to admire how the white accessories just pop against the yellow and how nice the dark legs look on the light chairs and ottomans. What a refreshingly inspirational space!